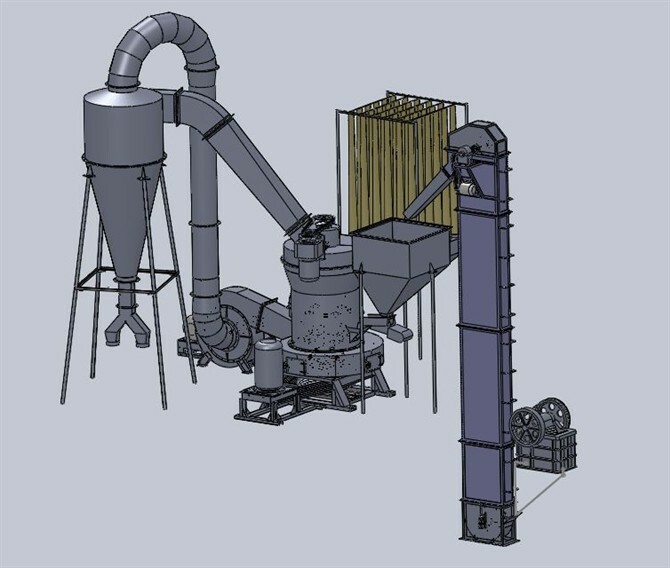 Gypsum Mill is developed from the raymond mill. After being grinded by the gypsum grinding mill,the gypsum powder(usually is about 120-200 mesh) mainly are used in the production of paper faced gypsum board. 1. Vertical structure, occupies small area. 2. Passing ratio achieves 99%. 4. Main parts of the whole plant are made from cast and steel of high quality. 5. Centralized controlled Electric control system , high automaticity. 01. Jaw Crusher crush the gypsum rock into smaller size in advance. 02. Bucket elevator sends the crushed gypsum rock into hopper. 03. Vibrating feeder sends the crushed gypsum rock into the grinding chamber of gypsum mill (Raymond Mill). 04. Roller and Ring grind the gypsum rock into powder. Under the function of blower and analyzer machine, only the fine powder can go through the analyzer machine, the coarse powder falls down and to be grinded again. 05. The fine powder which meets the requirement finally goes out through the cyclone powder collector as final products. Notice: Any change of Gypsum Mill (Raymond Mill)technical data shall not be advised additionally.